Mhumhi trailed behind Kutta as they walked slowly back to their home. In the late afternoon the city was starting to come alive again. More of the little dogs were emerging from their dwellings, mingling with their neighbors. The street grew crowded again. Kutta gave him a light, understanding nudge. Sacha’s scent was still pungent and strong on the wall outside. After his sister had slipped around the door, Mhumhi rose and trotted down the sidewalk, stepping gingerly over the littler foxes when he came across them. Many of them were congregating to go to the Oldtown dispensary for their daily meat, making Mhumhi think wistfully of the stuff he’d given Kebero. There’d be no more until the next day. He sighed, stumbling over the back of a startled island fox. He cut through an alley and found himself on a new street, not lined with houses but with storefronts and open stalls. As the shadows lengthened a few of the neon lights were flickering with a semblance of life, but it was a poor display. Little electricity still lived on in Oldtown. They called it ‘Food Strip street’ but Mhumhi had never seen any food that at all. He supposed the kiosks with their transparent shelves and clear-fronted refrigerators had once held food, for in places you could still catch a lingering essence of it, but they were brutally clean now, perfectly so, licked that way by a thousand starving tongues. Now, not being suitable for dwelling in, it was practically deserted. The fennec fox had mentioned, earlier, that this had been the place he’d first spotted the domestic, and Mhumhi had half a mind to investigate. At least cursorily. Most of the storefronts were dark, but here and there along the narrow street there would be one that flickered and flashed its bright white interior as the lights spat and sputtered. Mhumhi trailed along the edge of the street, sniffing at the sidewalk. Curious puppies had explored the area earlier that day, he noted, and splashed some urine across the gutter of the sidewalk, but he couldn’t catch a whiff of the blue-eyed domestic. Even as he thought that he looked up across the street to one of the flickering storefronts and saw a small dark figure watching him. It made him jump, for he’d seen the silhouette for only an instant before the store went dark again. The lights flashed up, and he flinched, blinking. There it was. A little fox, sitting on top of the gleaming counter, looking at him with round dark eyes. It had enormous ears which seemed nearly too heavy for its little head, for they sagged forward slightly and wrinkled the little brow. 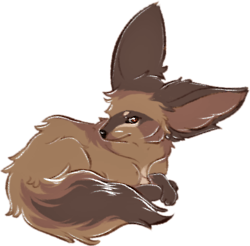 Mhumhi recalled that it was a bat-eared fox, this thing, as it leapt off the countertop and came out of the store towards him. It was limping slightly on its left back foot. Mhumhi was a bit surprised the little thing was talking to him. He supposed he was being mistaken for police again. “Hello,” he responded, trying to be polite, and tentatively sniffed noses. It was an older male, he gathered, and in poor health at the moment. “Oh, you did,” said Mhumhi, somewhat feebly, for as far as he remembered he’d given a poor show. Mhumhi’s own ears swung forward. Sacha… that would have been Sacha as a puppy. The thought of it made him smile, letting his tongue hang out. Had she been cross as a puppy, or had she grown into it gradually? How had his mother ever managed, poor thing? “What do you care?” said Mhumhi, though he was now beginning to feel a bit nervous. Kebero was something that needed to be fairly secret, until he grew to a respectable size, at least. A Simien wolf puppy traveling with any one of them would raise suspicions, and Sacha was keen not to have the police over, hunting for pup-thieves. “I’d like to help you,” said the fox. Mhumhi suddenly remembered the little body he’d nearly stepped on. “Usually I hunt around the sewers, around the dispensary drainage. But I didn’t want to risk putting this leg in that muck.” The fox glanced back at himself, and Mhumhi suddenly realized how he was holding his left back leg slightly raised, as if it were painful. The fur around his heel was coarse and matted with dried blood. “No, it’s been too tender-” the fox had started to say, but Mhumhi planted one big paw over his back so he could lean down and sniff at the wound. The fox squeaked. It didn’t seem very deep, but it cut all the way down to part of the pad. Mhumhi licked at it, pulling at the matted fur with his tongue, and the fox flinched mightily, but did not make another sound. “How did you cut it like this?” Mhumhi asked, as he worked. Mhumhi gave a disapproving little chatter at the thought, but he had managed to pull most of the matting and crusted blood away with his tongue, and exposed the wound, which bled a little. “I’m Mhumhi,” said Mhumhi, wagging his own tail, and took a moment to sniff around the coarse fur of the Bii’s hindquarters and tail, getting accustomed to his scent. Bii took it patiently, leaning against him and raising his injured paw gingerly. “No, no, you’ll feel much better off your feet, and anyway the walk isn’t long,” said Mhumhi, still smiling, and leaned down and caught the fox’s scruff in his teeth. Bii gave a single, undignified yap, then curled in his paws resignedly as Mhumhi turned and trotted back down the street, tail still wagging. He got more than a few alarmed looks, coming back down his home street with the bat-eared fox swinging resignedly from his jaws. Mhumhi kept his white-flagged tail high, feeling in a much better mood than before. If Bii’s meat went to Kerbero, it would mean far less regurgitation for him. He hopped up the curb in front of the hose, Bii tucking his tail in tighter as it brushed the concrete. They went inside, and Sacha hopped up to depress the door handle with her paws and pull it shut behind them. “You better have a good explanation, M-” She stopped, jerking her head back, for Mhumhi was whining and trying to lick her chin again, very relieved that she didn’t seem to be furious with him anymore. Eventually Mhumhi managed to get out the trade Bii had proposed, or some of it, though he was less eloquent about it than the fox had been. In the middle they were interrupted by Kutta running down the stairs to greet them and exclaim over Bii, and Mhumhi had to start over again. By the time he got through it, Sacha looked mightily skeptical. “And you opened his wound out there on the street!” said Sacha, trotting over to Bii. The fox gave her a startled growl, which she returned in full before bowling him over with her heavy head and examining his foot herself. “You’ll be the one to give him an infection, Mhumhi,” she said, licking at it. It didn’t seem as though she was being particularly gentle about it, for Bii was flinching again, but she was more skilled than Mhumhi and soon had the fresh debris out of the wound. Kutta nudged Mhumhi, flashing him a grin. “She likes having someone smaller than her around,” she said softly, and Mhumhi snorted and whuffed. Bii growled up at her from his prone position, but she ignored him, stub tail waving slightly as she got off him. Kutta gave Mhumhi a meaningful look and trotted up the stairs ahead of them. “Come on, Bii, you still have to meet Kebero,” said Mhumhi. Bii gave him a tired look and curled his tail securely between his back legs. Mhumhi picked him up again and bounded up the stairs. In the upstairs bedroom Kutta was play-boxing with Kebero, but the puppy quickly broke off at the sight of Bii, tail wagging stiffly. Mhumhi had been planning to deposit Bii directly onto the bed, but the fox suddenly squirmed in his jaws. Mhumhi obliged, and the fox tottered a bit before getting his bearings again. Kebero whined and looked at Kutta for some direction. Bii struck a peculiar pose, arching his back and tail, and hopped sideways towards Kebero. The motion was unfamiliar, but the intent seemed clear, and Kebero tensed for an instant before bowing on his front legs with his rump wagging in the air. At once Bii hopped at him with his front paws raised, surprisingly spry even with his injured foot, and Kebero gave a puppyish growl and raised up to box with him, tumbling him at once- even Kebero was bigger than him. Bii took it well and rolled on his back and pushed at his muzzle with all four paws, tail wagging against the floor. “They’re getting along,” said Kutta, glancing at Mhumhi, but he’d gone into a play bow instinctively at the sight of Kebero’s and now bounded up to her to shove at her shoulder, wagging his tail. “Oh, come on,” said Kutta, but he batted at her shoulder with his front paw and she twisted and boxed back at him, wagging tail betraying her. The four of them play-fought for a little while, panting and laughing, until Kutta noticed Bii, who was pinned under Mhumhi’s forearm, wincing and bleeding. Bii didn’t respond, looking weary, and turned to gingerly lick at his foot. Kebero jumped up beside him, ears back, and licked under his chin. Mhumhi had been poking at her again, but he slowly put his paw down. “Come on, listen to me,” said Kutta, shouldering him out of the bedroom and across to the smaller room on the other side of the stairs. It was a bathroom, with a knocked-over toilet revealing a gaping pit in the floor which two flies buzzed over. Mhumhi hopped up to the sink, batting at the encrusted gray knob until a thin stream of water reluctantly came forth. It tasted like alkali as he lapped at it. When he had finished he fell back on all fours, licking his lips, and Kutta hopped up to push the knob back down. Mhumhi smiled and blinked at her. “But Bii’s so little,” Mhumhi pointed out, wagging his tail. “So what? Keb likes him already, and you can tell he knows what he’s doing. I wonder what happened to his puppies?” Kutta’s brow wrinkled. “I wonder why Sacha agreed to let him stay?” Mhumhi offered, as long as they were posing questions they couldn’t answer. “Show me what secret?” Mhumhi asked, tilting his head. “Well, if it has to do with Mother,” Mhumhi said happily, though he noticed that Kutta gave a kind of anxious twitch when he said it. “I won’t!” said Mhumhi, excited in spite of himself. Tomorrow he’d be one step closer to his mother. No- perhaps they would find her tomorrow, perhaps she’d be all right, and she’d come home and meet Bii! She’d like him, he knew it. And Kebero would be so happy to see her again… he’s been so quiet and melancholy lately… yes, if she came back, everything would be so much better, and he was sure even Sacha would be pleased. With these thoughts cheering him, he followed Kutta back into the bedroom with a spring in his step. Bii and Kebero were asleep on the bed, Bii curled up with his nose tucked snugly in his tail, Kebero sprawled at his side, snoring softly. Sacha was there as well, using her forepaws to dig into one of the flat, ruined pillows. She glanced up when they approached and yawned hugely. Mhumhi could agree with that sentiment. He overtook Kutta and hopped up onto the bed himself, licking Sacha’s cross bear’s face before curling up on the edge of her pillow. Kebero opened his eyes and then jumped when Kutta joined them, squeezing beside Mhumhi so that her other side was solidly in contact with Kebero, who hadn’t moved. There was a great deal of creaking as the four of them re-situated themselves, tucking in their limbs where they could. Mhumhi yawned and laid his head next to Kutta’s, Sacha a warm knot against his shoulder blades. Tomorrow, he thought again, tomorrow his mother might be here… He happened to glance left and saw that Bii was still awake, his button eyes shining slightly in the dim light, his ears trained forward. His injured leg made the scent of blood linger in the air of the room as the remaining daylight faded away. “They called it ‘Food Strip street’ but Mhumhi had never seen any food that at all.” there at all? “I did, as well, but I crawled out there somehow.” out of there? “He hopped up the curb in front of the hose” house? “Kebero would be so happy to see her again… he’s been so quiet” he’d?